Kat: Worth it for the beautiful North Bend countryside. 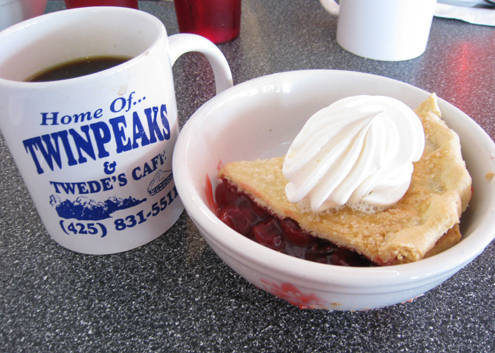 A rewarding stop after our hiking. Quite upfront about being a tourist trap. 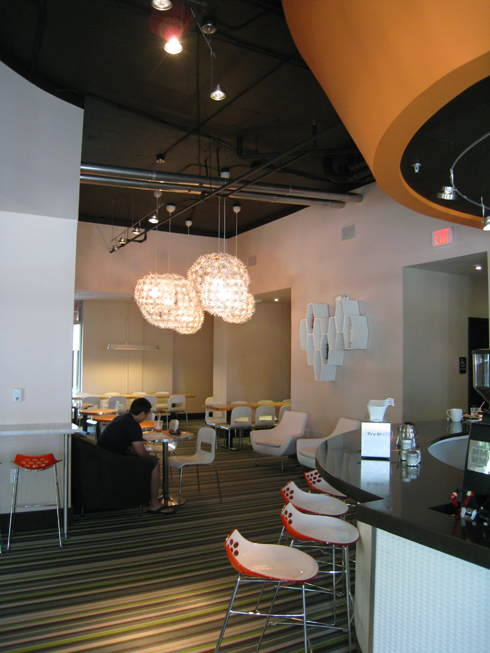 Kendra: Yelper’s liked it, we tried it–the egg custard was too eggy, but the coconut bun was sweet and satisfying. Kat: The coconut bun was a meal unto itself, although not really my thing. Egg custard was definitely on the hearty side rather than the sweet side. 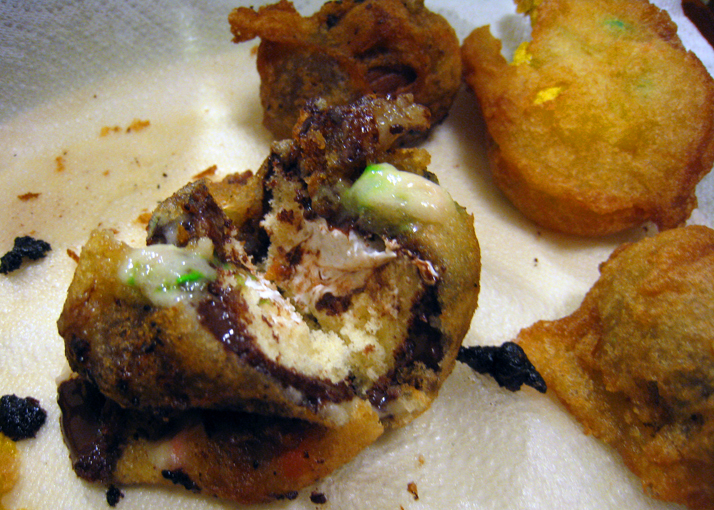 Kendra: I initially mourned the passing of Unicorn Crepes (mochi in a crepe? yes! 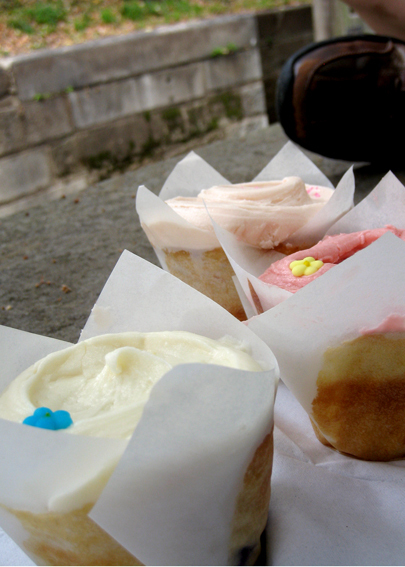 ), but at least Fuji Bakery is a worthy replacement. 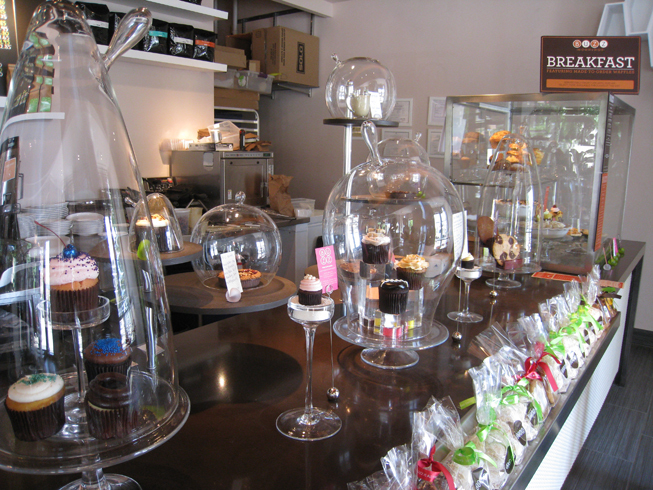 A French-style Japanese bakery with immaculate presentation–everything just looks PERFECT. It tasted good too–everything was great, but the pear tart was flaky, creamy, and delectable. Kat: Everything was presented impeccably, and the designs were sometimes quite unexpected. I was quite taken with the perfect cylinders of whole wheat bread. 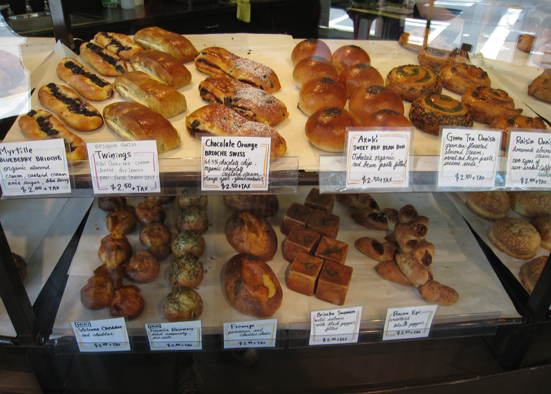 They have mainly dough-based offerings, covering savory through sweet. The Twinings Brioche, with quite detectable bergamot flavor, straddled the line between the two. With the cream cheese, although this pastry is lightly-sweet, it almost seems like an appropriate lunch item. 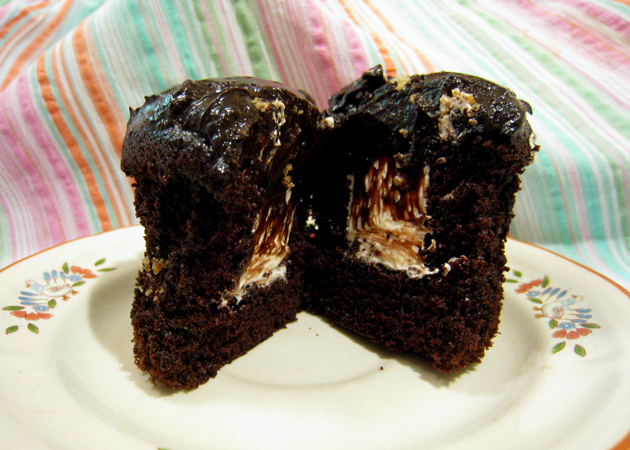 Chunks of candied orange peel embedded in the dough of the chocolate brioche elevated it to above-ordinary. And the pear tart was outstanding, definitely A-plus material. I should also mention that the staff behind the counter were quite friendly. Kendra: Usually cheesecake is too much for me, but these mini-cakes (almost like cupcakes, in a way) were the perfect size and ratio of cheesecake to topping. This lemon-based flavor was pretty refreshing! 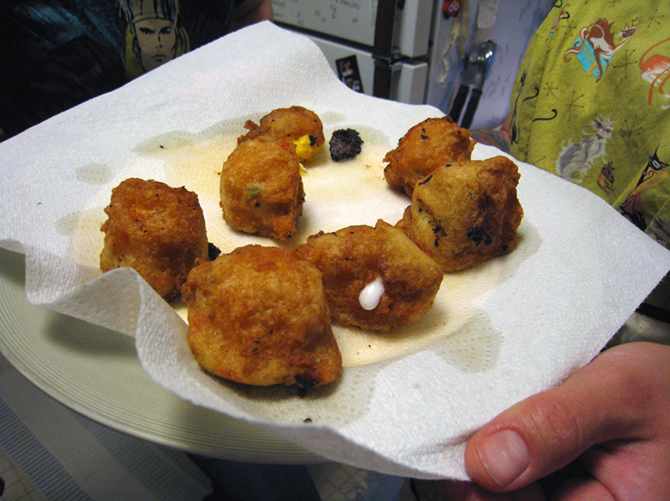 Kat: Really, really good, and the individually-formed and garnished presentation was quite appealing. Kendra: The line was so long, and I was so caught up in wanting to get a marzipan piroshky that when I was informed they were out, I stupidly ordered something that WASN’T a piroshky. Whatever fried-dough pastry I got wasn’t bad, it just wasn’t worth finishing (!!!). Kat: Not quite as exciting as it appeared from a distance. Messy. 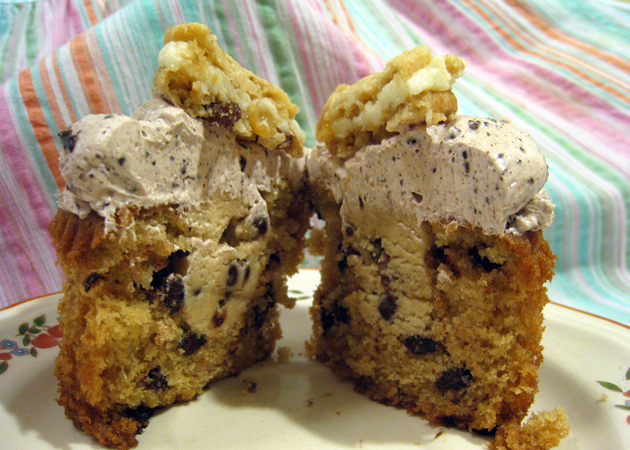 Kat: Dense, spongy cakes with airy frosting. I agree, the vanilla was the most satisfying. Kendra: This was quite off the beaten path, and doesn’t even have much signage to help you out–but the danish we split proved why it’s fun to explore. 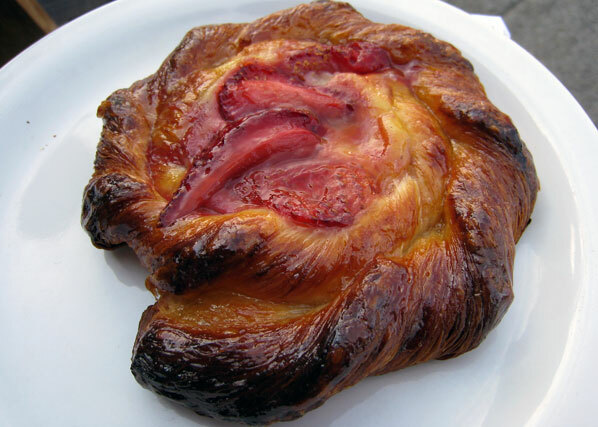 Kat: The flaky crust of the danish was top notch. A good pick-me-up on the way between the Ballard Farmer’s Market and Larsen’s Bakery. Kendra: SMORKAGE. Just say it out loud. SMORKAGE. An amazing name for what amounted to a breakfast sweet roll that was stuffed with almond paste. DELICIOUS. I have to say, this place was by far my favorite sweet-spot on the trip. This is due in part to the fact that ‘Swedish’ is shorthand for ‘stuff/cover everything with almond paste or marzipan. I LOVE MARZIPAN. 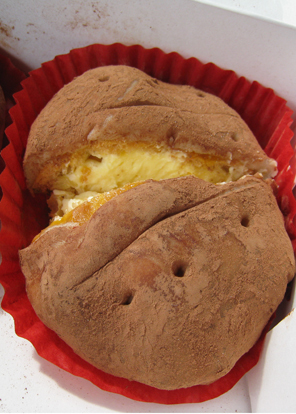 The ‘potato’ was amazing–it’s basically an eclair that also has apricot jam, which is then wrapped in marzipan, coated in cocoa powder, and decorated to look like a potato. 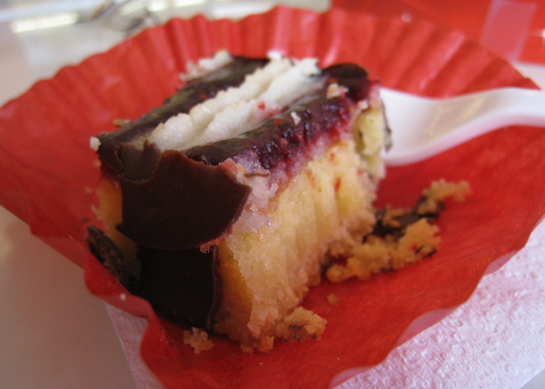 We ate it for breakfast, paired with ‘cupcake-flavored coffee’ from Caffe Lieto. 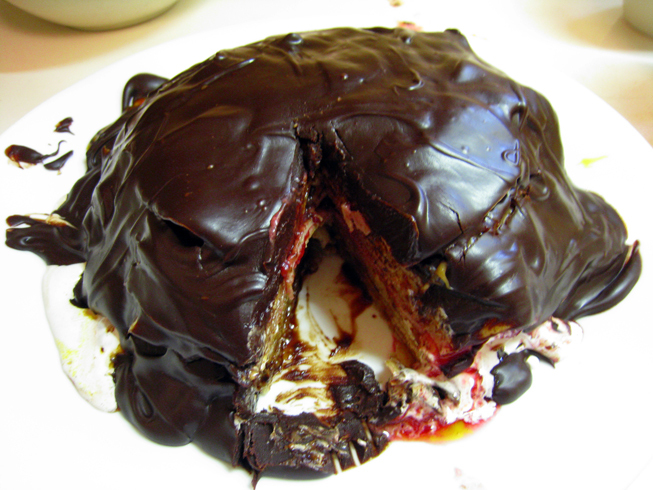 The mazzarine was almond paste, chocolate, raspberry jam, pastry….need I say more? 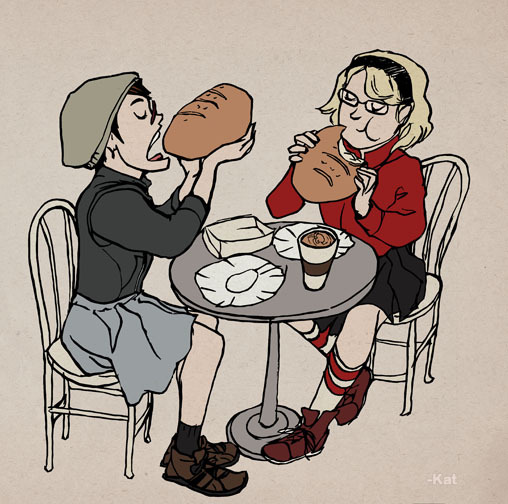 Kat: So many baked goods. Cases after cases. And nothing has name cards, which makes for extra adventure. Toss-up between whether I miss this or Fuji Bakery more. 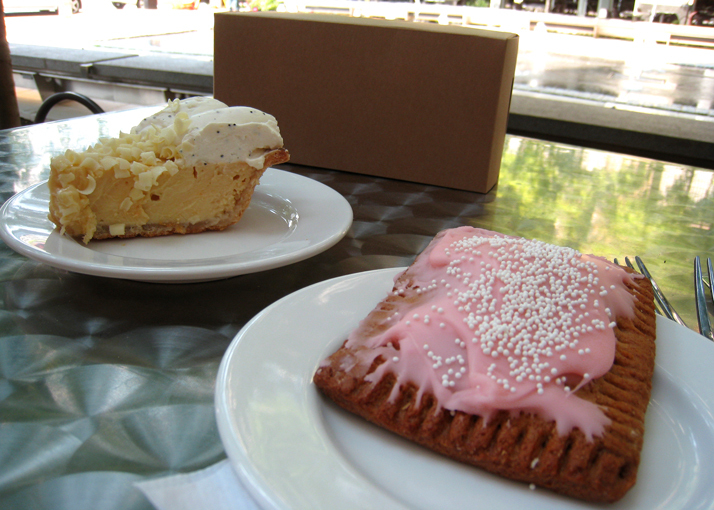 The raspberry mazzarine thing was everything I want in a pastry, and extra-satisfying after 6 mile walk around Ballard. Definitely an A+. Smorkage is a big, ring-shaped coffee/breakfast-like thing. Tasty, but more snacky than satisfying. The Potato was a behemoth of a dessert. Quite nice, in that ‘will this kill me’ way. A heavy-hitter of the pastry league. Kendra: After three previous attempts to buy a crumpet from here ended in failure, we had a SUCCESS. Was it worth all the trips? 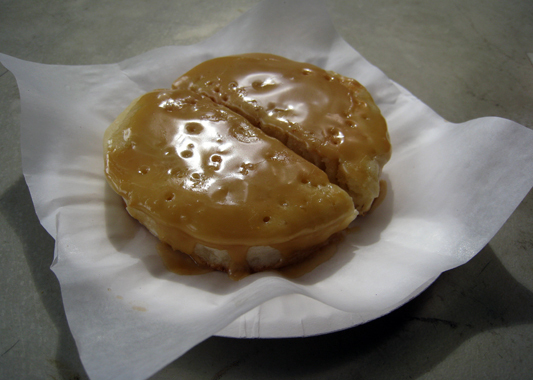 Hey, cross an english muffin with a pancake, cover it in maple butter, and try to resist it! YOU CAN’T. It was delicious. Kat: Quite nice, but not necessarily worth going early for. 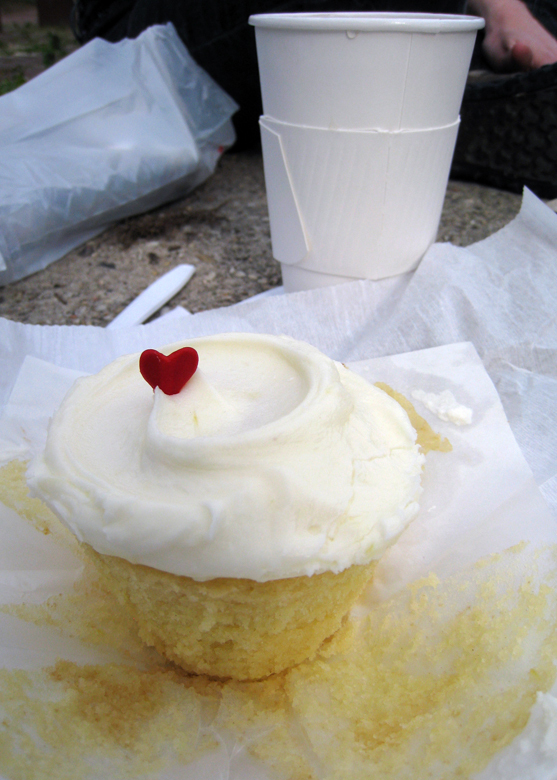 Yellow Leaf Cupcakery–CONSUMED: Lavender cupcake, what was the other one…Dulce de Leche? 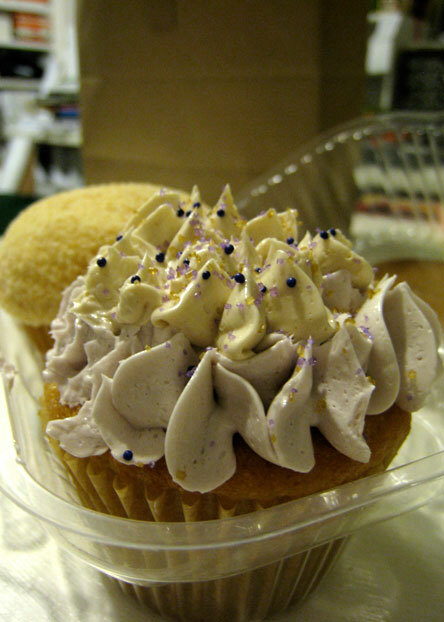 Kendra: This place reminded me of Lavender Moon back home; creative flavors, light cake base, cream cheese-esque frosting, tiny shop. Pleasant. 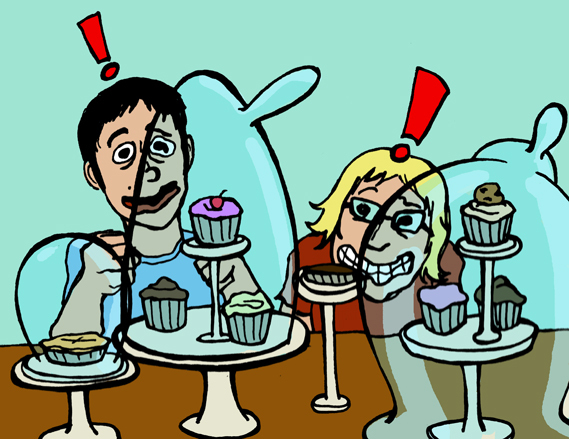 Kat: I actually can’t remember these cupcakes at all, but I did appreciate the range of flavors available. In CONCLUSION… Miles walked: Many Calories consumed: countless Seattle: Only partially conquered! 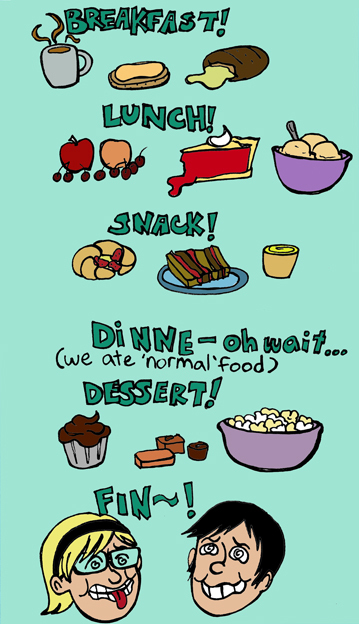 We just got back from Seattle, and boy did we eat a lot! Once we finish digesting we’ll put up a proper post. 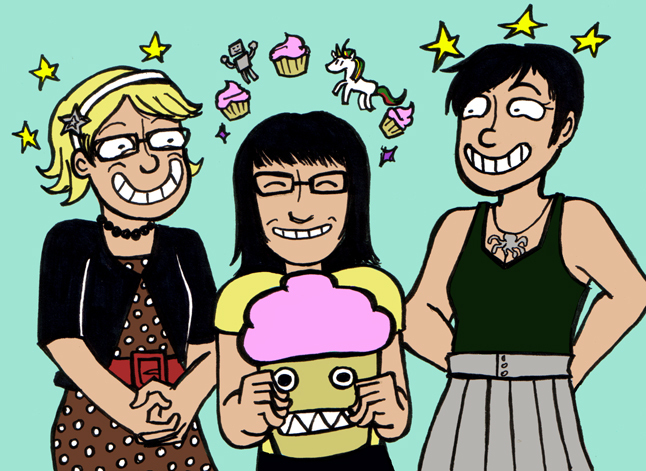 We ate smørkage, drank cupcake coffee, and even met Cakespy! 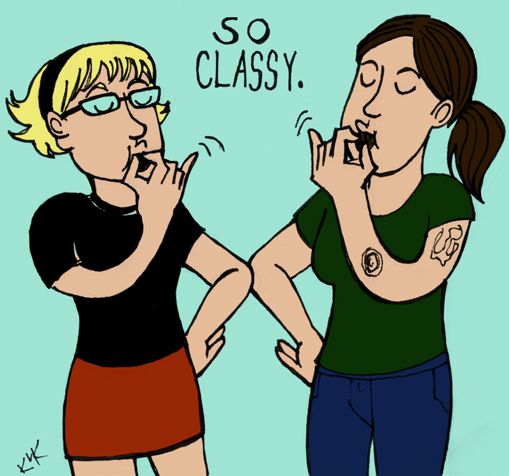 And a special guest review from an honorary Sugarvamp, Miss Mary! Raspberry Cloud: At first, I was convinced that this cupcake reminded me of a candy flavor I couldn’t quite place – a lemon or lime jolly rancher, maybe? 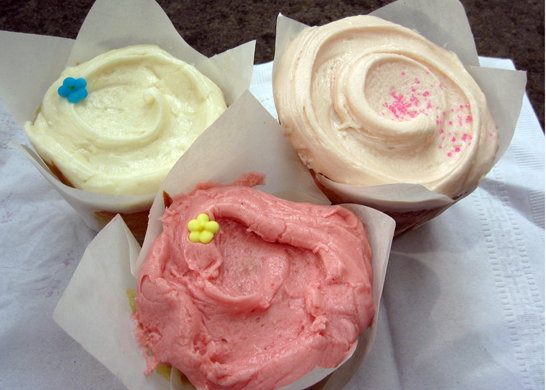 – , but after a few more bites and input from Kendra, I changed my mind – this cupcake is remarkably like sherbet. The raspberry cream cheese frosting is smooth and light and almost melts in your mouth, but has a hint of a kick that really does mimic tangy, refreshing sherbet. Add in the lemon cupcake base and you’ve got your summer treat. I was surprised that I didn’t notice cream cheese overtones as I often do with cream cheese frosting. 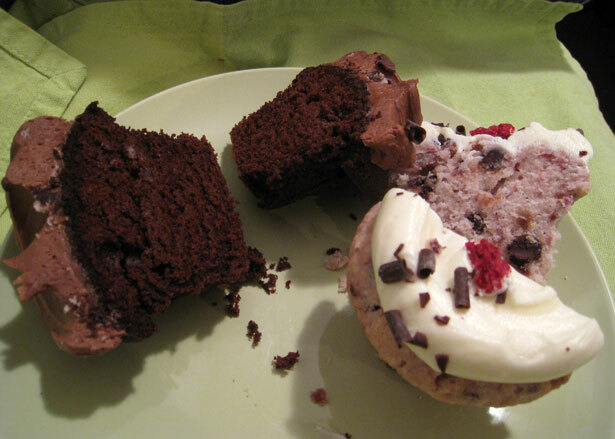 This cupcake’s weak point is the actual cake part. Not bad, per se, but it’s a little bland. A solid B. 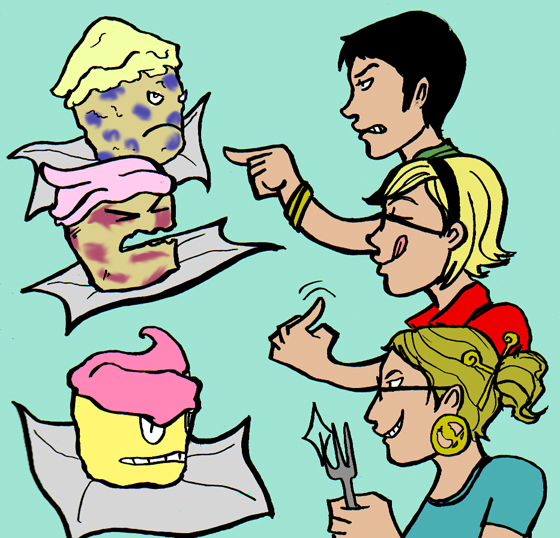 Strawberry: Katie observed that this cupcake is really more like a muffin, and not in a good way. 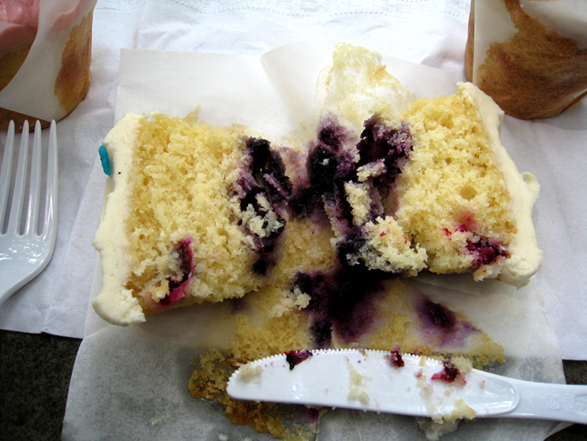 The texture of the actual cake is pretty coarse, and I wasn’t impressed with the frosting, either. Forgettable. I give it a C mainly because I tend not to like strawberry-flavored things, so someone who does might not be so turned off by this one. 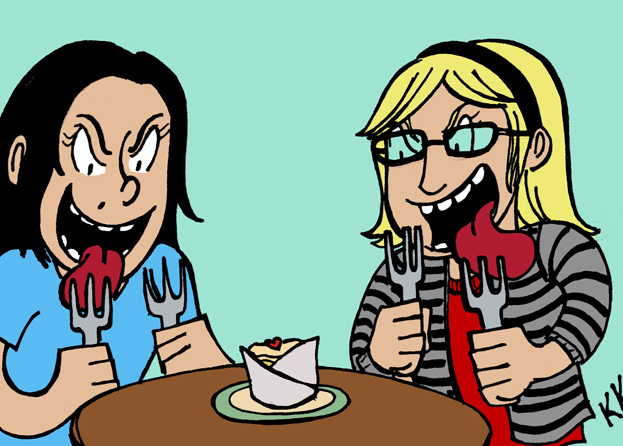 In the halcyon days of Kat and my college years, we forged a strong bond with the university’s crepe ladies. See, JMU‘s dining service is one of the things that it’s known for (apparently)–and goddammit, I’d rather have good food than a good football team! Fortunately, in addition to the normal buffet-style cafeteria in the middle of campus, JMU boasted dining options covering sushi, Starbucks, paninis, gyros, noodle bowls, and…crepes. The crepes were huge, and you had the option of slathering them in nutella, caramel, raspberry sauce, whipped cream, bananas, strawberries, blueberries, ice cream…needless to say, all these would cost you extra. Well, they’d cost YOU extra, but since we were TIGHT, our crepes were made with extra ‘love’ FOR FREE (‘love’ being all them goodies). Anyway, blah blah blah, we love crepes, and feeling lazier than usual, we decided to forgo any actual baking and settled on making a milles crepes cake. 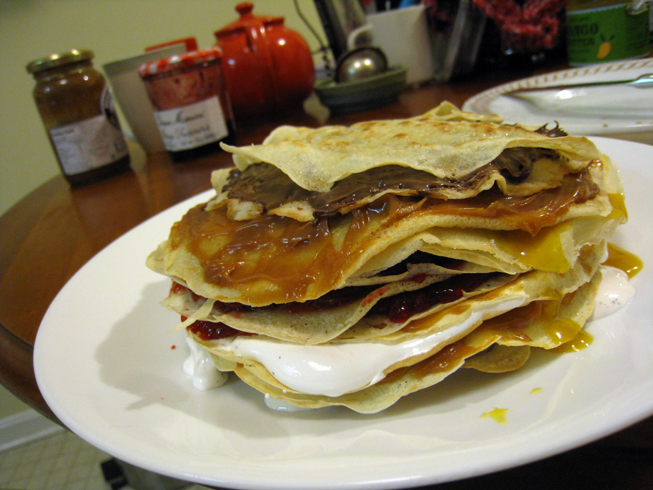 It’s basically a tower constructed of crepes, except replace ‘cement’ with ‘frosting’. Of course, since it’s us, we decided to bust out every spread/topping from the pantry, and then cover the entire deal in a chocolate ganache. 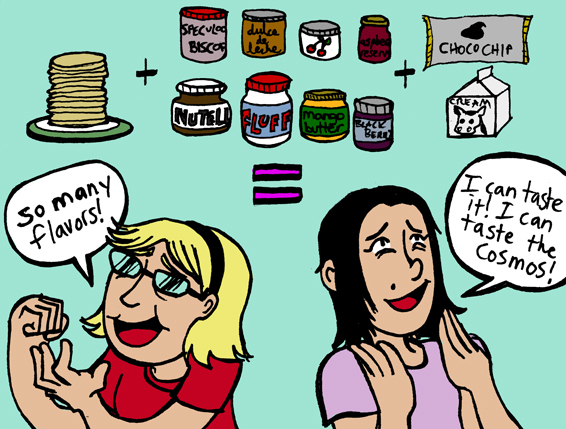 The following are delicious spreads I had in my pantry: marshmallow Fluff, Nutella, dulce de leche, raspberry preserves, cherry preserves, blackberry preserves, Biscoff spread, aaaaand mango butter. YEP. 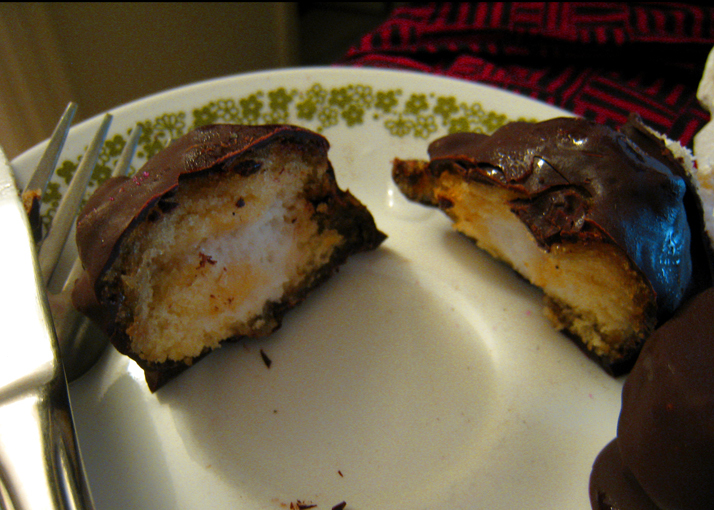 Then, like most of our other creations, we covered the entire thing in chocolate ganache. YEP. 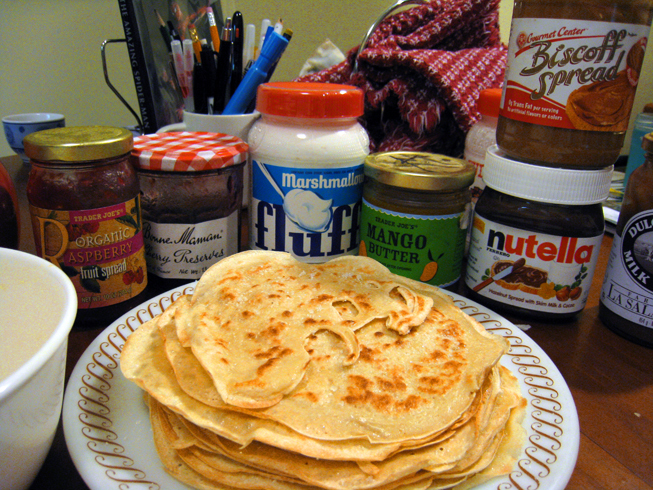 I’d post a recipe, but all you really need is a bunch of crepes, a bunch of delicious spreads/frostings/whathaveyou, and some chocolate ganache (this time I tried out Martha Stewart’s recipe). I recommend microwaving this sucker before eating it, since cold crepe texture is…not so great. From now on, when life gives me lemons, I’m gonna shove some raspberry preserves in the middle of it if I can get it to taste like this cupcake. 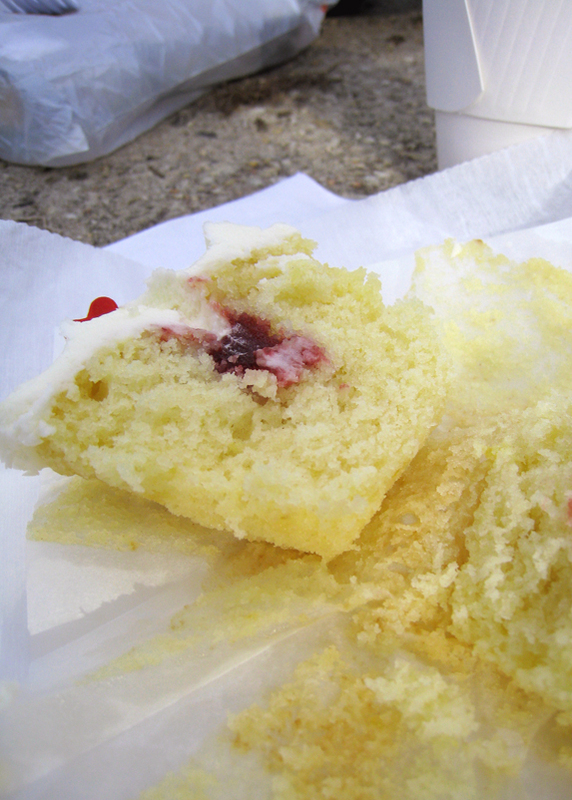 Website says it’s “Lemon cake with a raspberry jam center topped with lemon buttercream“.